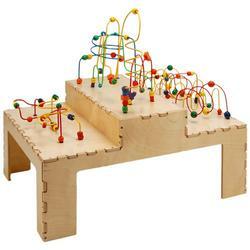 The Step Up Rollercoaster Table features a unique 3-tier step up design appealing to children of different sizes and ages that includes classic and colorful wire and bead toys. Children learn color recognition, counting, eye-hand coordination, and cooperative play, while playing for hours on end. The different tiers and heights allows for kids to play standing or sitting and encourages group play. This table is made of the highest-quality wood and built to last for years of use and enjoyment. It is a wonderful activity center for play areas, schools, waiting rooms, doctors offices, and even the home! 24" x 35" x 31"